EARMARK offers a unique line of communications headsets and the capability to configure a system designed to suit your needs. The EARMARK line of headsets includes three primary models, Series 4, Series 5, and Valcomm 900. When used in conjunction with various accessories, including a repeating headset, a base station, modular systems, and replaceable external battery packs, your EARMARK communications system can be configured to meet the requirements of most any industrial, military, law enforcement, city government, or construction environment. The noise canceling boom mic used on all EARMARK headsets can be effectively used in noise environments up to 120 dB, the highest of any comm headsets we know about. All EARMARK headsets are made for heavy daily use, and they are fully adjustable, with nice padding, for all day comfort. All EARMARK headsets are available in headband models (with a unique backband that prevents the headset falling off when you lean over your work) and hardhat mount models. All EARMARK products are made in the USA, and are fully qualified to meet all "buy American" purchasing requirements. All EARMARK products carry a one to three year warranty. For more information, or to receive a quote on EARMARK equipment, please contact us at: or call 1-918-478-5500. ValComm 900 Radio Headsets are fully self-contained and come in two models: a two-way radio communications headset, and a receive only headset, which is ideal for use as a plant tour headset. ValComm 900 headsets can be used by pairs of individuals in full duplex mode (speak and hear as you would with a telephone, without the need to push a button to transmit.) ValComm 900 can also be used in groups as large as you need, as a voice activated transmit (VOX), and/or push to talk (PTT) two-way radio, or as a plant tour system, in which visitors wear receive only headsets, and the tour leader transmits to all at once. ValComm 900 headsets offer NRR 26 noise protection which is adequate for noise environments up to 111 dB. ValComm 900 operates in the 902-928 MHz frequency range and so does not require an FCC license of the user. ValComm 900 headsets are powered by internal rechargeable NiMh batteries, with a transmission range of up to 150 yards. 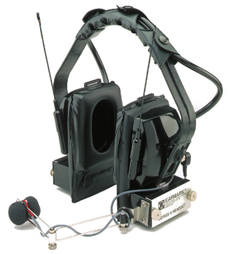 ValComm 900 headsets are an excellent choice for shooting ranges, arborist teams, industrial maintenance teams, plant tours, construction site logistical teams, and many others who need a rugged, reliable, small area communications system that can work well in noisy surroundings. The list price for the ValComm 900 two-way radio headset is $725. Please contact us for a quote on your specific system needs, and let us know if you have specific communications challenges you need to address. EARMARK Series 4 communications system components are certified Intrinsically Safe, and provide you with a wide range of customization options. 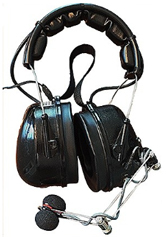 Series 4 is available in a self-contained headset, a modular headset with the battery in a separate belt pack that reduces the weight of the headset and allows the use of secondary external rechargeable batteries for extended use in the field, and in two belt-mounted models that provide you with the ability to use a high noise headset when working in a high noise environment, and then a more comfortable light weight headset when you go to your office. Series 4 systems can be configured for open mic use, so everyone can talk and hear without the need to push a button, or as a traditional push to talk system. Series 4 systems can be further configured so that independent teams can be linked through a mixing base station that enables the base station manager to fully manage who can hear whom, from one central location, as well as broadcast to all members of all teams, or any subset, as may be needed. Series 4 units can be integrated into your existing two way radio systems as well. Series 4 has a transmission range of up to 1/4 mile, and operates in the 72-76 MHz frequency range which requires an FCC license. Series 4 can be powered by two 9 volt disposable batteries, or configured to be used with an external rechargeable battery pack, with extra battery packs available for in-field backups. These capabilities make Series 4, an exceptional choice for addressing the needs of cities for communications among and between Police, Fire, Medical Emergency, and other city teams. With its intrinsically safe certifications, Series 4 is also an excellent choice for the most demanding mining, extraction, and processing facility teams. EARMARK stands ready to design a system to meet your extraordinary communications challenges. Because Series 4 is designed to be customized extensively, pricing will vary widely, but is estimated to be around $1,200-1,600 per headset. For a quote, please contact us. We will put you in touch with our experts in EARMARK systems and once we know your requirements, we will provide you with a detailed quote for your EARMARK system. EARMARK Series 5 communications headsets are a less expensive, lighter weight alternative to the Series 4, for those who have fewer communications system challenges, and who do not need an intrinsically safe headset. Series 5 comes in a headset model only, but with its 3.6V NiMh rechargeable power supply, offers extended operating time (up to 12 hours in full duplex!) a higher NRR 29 noise protection rating, and a more comfortable ergonomic design. Series 5 headsets are available in a variety of configurations to provide all modes of communication, as well as to act as a repeater to support team leader override communications functions. Series 5 headsets are fully compatible with Series 4 system components, including headsets, belt-packs, and base stations. Series 5 has a transmission range of up to 1/4 mile, and operates in the 72-76 MHz frequency range which requires an FCC license. Series 5 can also be customized to most any radio frequency you need. Series 5 headset systems are priced around $1,200 to 1,600 per headset, depending on the specific customizations needed. EARMARK LW-26 is a light weight version of the Series 5, which offers an NRR 26, and just one mode of operation; Push to talk and/or voice activated transmit (VOX). LW-26 comes in headset or hardhat models, and with its 3.6V NiMh rechargeable power supply, offers extended operating time (up to 12 hours in full duplex!) LW-26 headsets are fully compatible with Series 4 system components, including headsets, belt-packs, and base stations. LW-26 has a transmission range of up to 1/4 mile, and operates in the 72-76 MHz frequency range which requires an FCC license. LW-26 can also be customized to most any radio frequency you need. 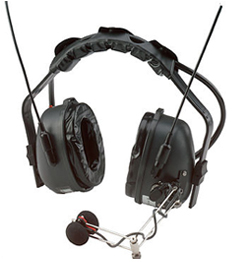 LW-26 headset systems are priced around $1,000 to 1,200 per headset, depending on the specific customizations needed. EARMARK Base Stations are available for a variety of team applications. EARMARK offers a Compact Base, a small, fixed base station that supports live mic, full duplex communications between two locations as well as half-duplex two way communications with an unlimited number of others. The Compact Base is ideal for point to point communications such as a manger to the guard gate or crew foreman to crane operator. The EARMARK Crane Base is made to support live mic, full duplex communications among three-member teams such as a construction crane crew, or a mobile first responder team with the Crane Base installed in their vehicle. Moving up to support larger teams, the EARMARK Multi-Man Base supports live mic, full duplex communications with up to 8 team members. If these stock base station options do not address your unique communications problem, EARMARK will design and build a base station that will solve your problem. EARMARK LoudMouth HazMat comm system features a 125 dB speaker for incoming comm traffic, and a throat mic for transmitting. Used by firefighters and other first responders, LoudMouth is fully waterproof and works with all personal protective equipment in the harshest environments. LoudMouth can even stand up to decontamination without damage. The LoudMouth System's list price is $350.